Named after legendary racing driver Bernd Rosemeyer, Rosemeyer Project is the Audi’s super-sports Car built in the Year 2000. 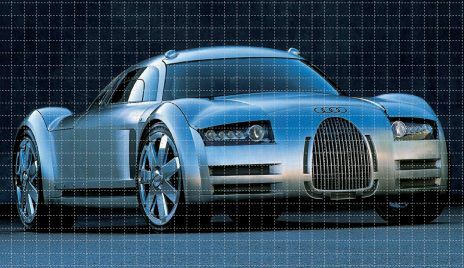 Now you can download flash-based interactive Audi Desktop Wallpaper for your PC. To see this Wallpaper on your Desktop, your operating System must be able to load HTML file as Wallpaper File!!! It is best if viewed on resolution of 1024x768 pixels. Download all three files in the same directory on your PC. Clicking with the right mouse button on your Desktop, click on Browse in Display properties, find the new HTML File and set it as the new Wallpaper. Static Wallpaper is the Past!!! * To edit the HTML you may use the Notepad Editor and simply change the URL and descriptions. To start editing use: “View Source” in Browser. ** Simplified, you may use your own background as long it has a same name as the Original. Any Background bitmap is presented as tiled Picture. Used Picture is Copyrighted under the respect of its Owner: AUDI AG. - FlashTM is a trademark of Macromedia, Inc.